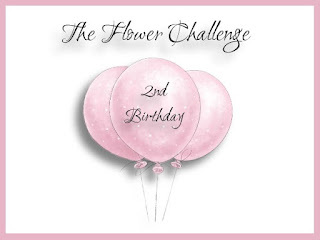 Hello everyone: This month of October we at THE FLOWER CHALLENGE are celebrating our second Anniversary, I can't believe that it's been already 2 years since this challenge blog, that celebrates FLOWERS was created by the totally talented Aileen Ryan and Vivien Hodge. It's been quite a ride, full of fun, support, love, care and patience, I'm one lucky, lucky gal having all of these wonderful ladies to work with. My teammates and I want to thank all of you who have participated in our challenge for the last 2 years, we hope you'll continue to play along with us this year. I also want to thank my amazing teammates, they are incredibly talented, kind and generous, it's a privilege to be in their company. 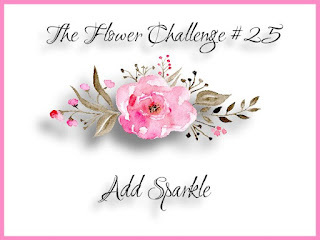 So, to celebrate THE FLOWER CHALLENGE second Anniversary, we want you guys to add SPARKLE to your cards, the more sparkle the better. Here is my card and I hope it will inspire you to come and play along with us in our gallery. We have a surprise for the lucky winner that I'm sure you'll love so, get your glittery goodness ready, create something sparkly and come to join the fun. This is an image from the Power Poppy set called POINSETTIA. I stamped it on a die cut panel of water color paper with Versafine Black Ink and clear heat embossed it, I colored it with SU markers, I added some shimmery Rusty paint to the little fruits and using a glue pen, added some light green glitter to the flower. I truly hope you can see it, it's really hard to photograph the sparkle. The die cut is from Spellbinders and it's called A2 Tranquil Moments. The border on the top is from a retired SU set called "Delicate Details", the sentiment is from the Poinsettia set and the small flower from another Power Poppy set called Merry Littles. So I hope you come and join my teammates and I and help us celebrate our second Anniversary. Please remember to make FLOWERS the focal point in your cards. 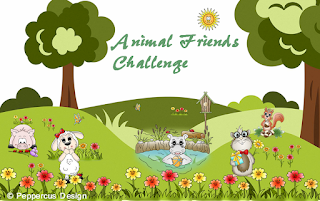 Please add our challenge banner to your post when you add your cards to the gallery. You can participate in 6 other challenges only. Well, it's true, October is here!!! Where did the year go?? I love Autumn and all that comes with it, from the cooler temperatures to the magnificent colors and, of course, HALLOWEEN!! So I'm sharing this card that will be added to my considerable stash of "spooky" greetings ready to be sent out. The image and the sentiment are from a Power Poppy set called Feeling Fall. I stamped them with Versafine black ink and clear heat embossed them and colored them with SU markers, then I embossed a panel of rusty card stock with a retired SU folder, (I forget the name, I apologize). Both the sentiment and the gorgeous spider are from a retired SU set called "Dark and Dreary"
I went with the middle horizontal line, ribbon, pumpkin and any embossing. Animal Friends Challenge #67 October "Autumn or Halloween"
Unicorn Challenge #37 "Autumn or Halloween"
Paper Minutes Challenge #557 "Watercolors"
Hello everyone: The new challenge over at SHOPPING OUR STASH is PEARLS, love this little treasures from the sea. 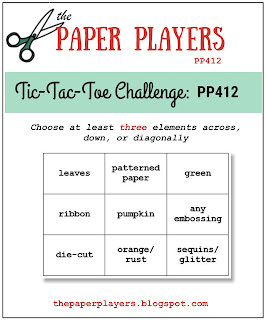 This is my card that I hope will inspire you to come and play along. The embossing folder is a super old one from Stampin' Up! I don't remember the name but it's beautiful, as you can see. I just embossed a panel of white cardstock with it and then, colored it with Picked Raspberries and Shabby Shutters distress inks. I added the pearls to the center of the flowers. Most times, I stamp several images and color them just to have them at hand, it saves me lots of time because I go to my box where I keep this images and, if the theme of a challenge calls for one or I need one to fill in a space, I have it ready to go. This image and the sentiment are from an old Flourishes set called "From the Garden". The border on top is from a retired SU set called "Delicate Details", the sentiment is from a Power Poppy set called Everything's Even Rosier, the little flower on the corner is from a retired SU set called "Stippled Blossoms". 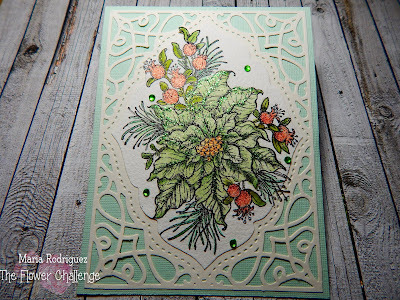 I hope you stop by the SHOPPING OUR STASH challenge blog to get more inspiration from my teammates' creations and then, come and join us in the gallery. Dream Valley Challenges #187 "PEARLS OR GEMS"
An option of embossing, wet or dry.